With the Spider-Powered Megatron mowing through everybody, Bumblebee, Jazz, and Wolverine use the orbital bounce (a form of teleportation similar to the “ground bridge” in Transformers Prime that IDW writers seem to have forgotten exists in their Transformers version…although they created it) get into the array. Spidey is about to charge up Prowl and Ratchet but Wolverine steps in for the weakened hero. Then his group of Autobots go after the psycho prism with Doom’s help. (Ramjet just said “slag it all” and flew off, which oddly leads to his Transformers Spotlight issue.) Megatron is force to burn off the rest of the Spider-power to get his troops out of there and the war between Latveria and Symkaria is averted. The Autobots leave but a sequel is teased because something is odd about the Quintjet. What they got right: I think Moore did a better job with both the Avengers and Transformers than the people writing them at the time (Bendis and Furman). The art was also good. It’s too bad he never got to write the sequel. He also remembered humans don’t do well with orbital bouncing. 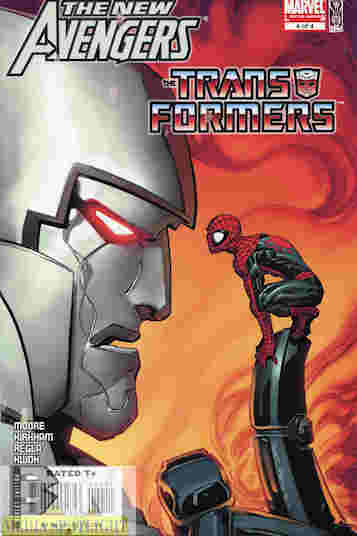 Also, the homage to Spider-Man’s appearance in Marvel’s The Transformers #3 was a nice bonus. What they got wrong: I had a hard enough time figuring out how Spider-Man could be used to create (for lack of a better term) super Energon but at least he has radioactive blood (as we all know). Wolverine has adamantium and a mutant healing factor (and I’m assuming the Decepticons were using Doctor Doom’s notes to even know what that means), so how did he do that? Recommendation: This was better than both of the titles going on at the time individually. This is a crossover I very much recommend looking for if you’re a fan of both series. This is the crossover we wouldn’t get after Marvel shifted them to their own universe. Posted by ShadowWing Tronix on August 16, 2014 in Marvel Spotlight, Yesterday's Comics and tagged Autobot, Megatron, Spider-Man, Stuart Moore, Symkaria, Todd Klein, Transformer, Wolverine.